Order your own copy of Mask of the Oni at your local retailer or online through our website today! 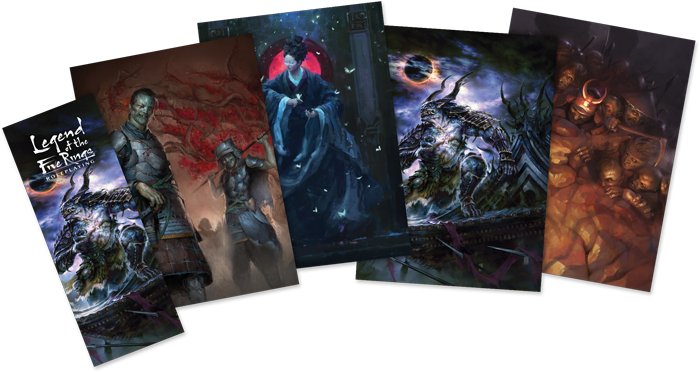 As a special bonus for pre-ordering Mask of the Oni through our website, you’ll also a receive a bookmark and four 5" x 7" art prints showcasing art from the book! This bookmark is the perfect way to mark important sections of the adventure such as charts or NPC information. Meanwhile, the art prints represent beautiful moments and characters found within Mask of the Oni! Mask of the Oni begins as your players take a perilous journey to the ruins of Shiro Hiruma, the once-proud stronghold of the Hiruma family of the Crab. There, the characters must face dangerous opponents, stark horror, and their deepest fears if they wish to survive. While traversing into the Shadowlands is a dangerous quest for any group of samurai, Mask of the Oni gives players and Game Masters all the tools they need to keep their adventure organized and running smoothly, including a 32-page adventure booklet that drives the narrative of the campaign. The first section of this booklet lays out the adventure background, split between what the players should know and secrets withheld for the Game Master's eyes only. Here, you'll find details on the fall of Daylight Castle prior to the construction of the Kaiu Wall, and the subsequent attempts that the Hiruma family has made to try and reclaim it. 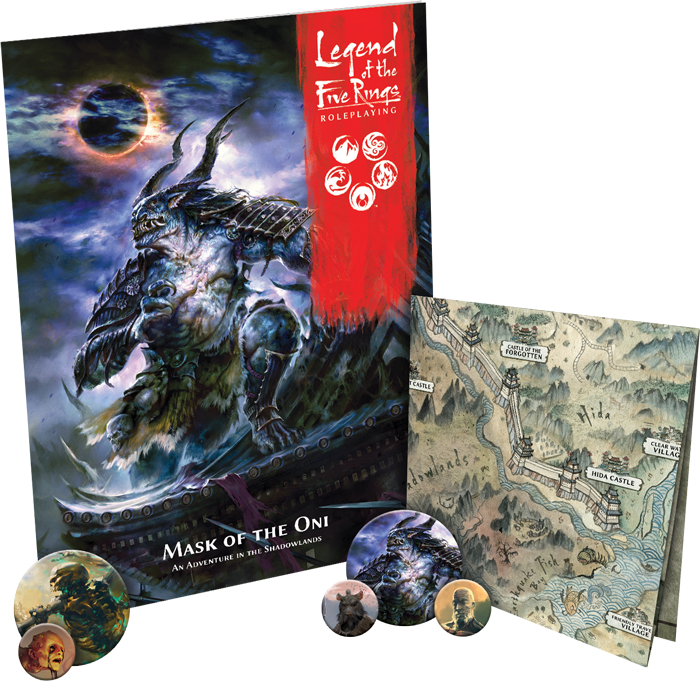 Mask of the Oni can also be played as a follow-up to the Dark Tides adventure found in the Legend of the Five Rings Roleplaying Game Master's Kit or as a completely standalone adventure. Either way, the booklet gives the Game Master plenty of ways for players to become involved in this dark tale. From there, the adventure booklet gives the Game Master everything they need to guide the players on their journey, providing a narrative that accounts for player choice and dialogue. With the adventure book in hand, any Game Master can run Mask of the Oni with ease. The adventure booklet isn’t the only tool for Game Masters and players included in Mask of the Oni. 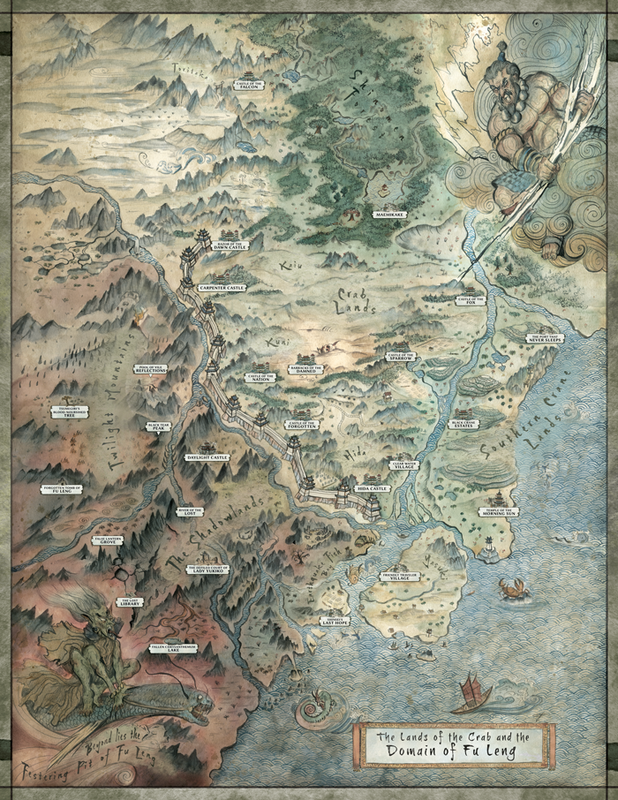 You'll also find a beautifully illustrated, double-sided fold-out map that depicts the lands of the Crab Clan, the Shadowlands, and the ruins of Daylight Castle. These vivid maps not only provide a visual identifier on where the players currently are, but steep your game in atmosphere and allow players to become engrossed in your story. With such a wide swath of land covered by the map, it can also be useful in any of your own adventures that you choose to locate in the Shadowlands. More than 50 tokens are also included in the adventure to helps players visualize their surroundings. These tokens represent the various NPCs—both friends and foes—that you may come across during your journey, and they not only convey important locational information during combat, but they can also provide a visual identifier for what these characters look like. The dread, disgusting monstrosities that call the Shadowlands their home are brought to life with these tokens, and like the above maps, they can be used in any adventure taking place south of the Kaiu Wall. The foreboding Shadowlands await your players. If these brave samurai have any hope of survival, they’ll have to reckon with the horrors that await, a dangerous blood speaker, and the knowledge of an ancient secret. Can your players survive the perils in Mask of the Oni? Find out in the first quarter of 2019! 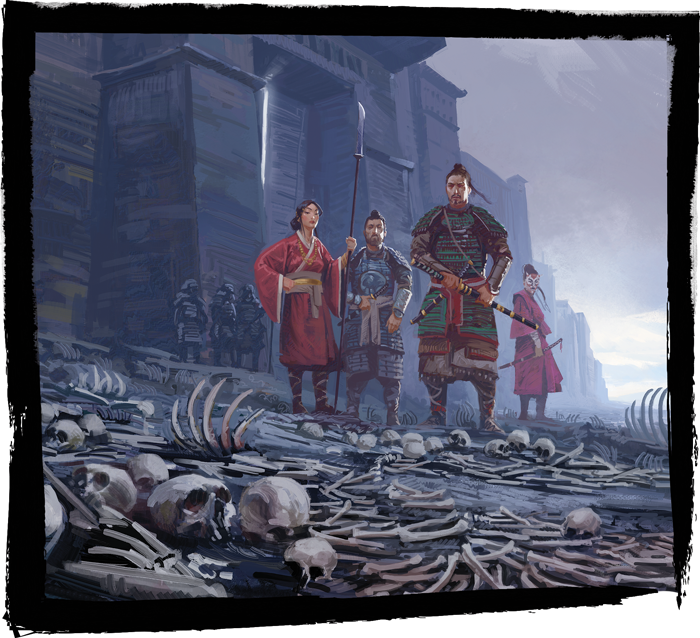 Discover the horrors of the Shadowlands with Mask of the Oni (L5R07), available now for pre-order from your local retailer or our website!